A contract has been concluded between you and A MON SEUL DESIR (SIRET : 502 025 554 00010 RCS PARIS) when your order has been confirmed by A MON SEUL DESIR. The acquisition of a good through this website entails the unconditional acceptance of these conditions of sale. The buyer therefore declares to have read it at the time of placing his order. You are only allowed to purchase products in the A MON SEUL DESIR online shop if you are a private consumer. A MON SEUL DESIR is a registred french trademark since December 2007. Any reproduction, integral or partial of the brand is systematically dusbjected to the only authorization of the owner. All texts, photographies, illustrations and images on the site "amonseuldesir.net" are protected by copyright, trademark and image rights. No one is allowed to reproduce, exploit or use for any reason whatsoever, even partially, visual or others elements of the site. Products concerned by these terms and conditions are presented on A MON SEUL DESIR website. These products are offered within the limits of available stocks. A MON SEUL DESIR is not be required to deliver items out of stock. Products are - for the most part - handmade items. As a result, sometimes they may be subject to subtle variations in shape, size, or color. A MON SEUL DESIR is a VAT free Micro-Entreprise ( TVA non applicable, art. 293 B du CGI ). The prices posted on A MON SEUL DESIR do not inclued shipping costs, invoiced in supplement, and indicated before the validation of the order. The applicable price is the one stated on A MON SEUL DESIR in the in respect of the relevant product on the date of placing of the order. 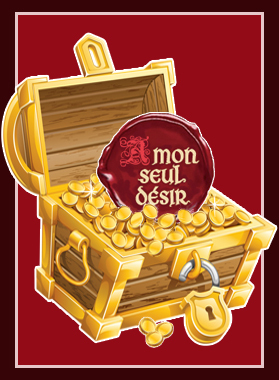 A MON SEUL DESIR reserves the right to amend any prices incorrectly stated in this online shop. A MON SEUL DESIR reserves the right to amend any prices or costs stated in this online shop at any time, due to changes to our own suppliers's prices. Please note that some banks do charge an extra overseas transaction fee. This fee may be charged by your bank (not us !) and won't be refunded by A MON SEUL DESIR. Please also note that your country may charge - sometimes - customs duty. This customs duty may be charged by your country (again, not us !) and won't be refunded by A MON SEUL DESIR. A MON SEUL DESIR is a small craft company, that's why we do not sell wholesale. All shipments are provided with tracking information. Once your payment is finalized, we will keep you in touch shortly with your tracking. Your orders will usually be shipped within 2 working days. Except during public holidays and weekends. A MON SEUL DESIR reserves the right to prevent persons - with whom there could have been a previous dispute - from shopping via his online shop. Payment is due upon confirmation of your order via the shopping cart of A MON SEUL DESIR. We accept international payments by using PAYPAL. PAYPAL is a safe instant and secure electronic payment. Unless otherwise specified, delivery is made to the address indicated by the buyer when ordering. In case of error on the part of the buyer in the wording of the recipient's postal address, A MON SEUL DESIR can not be held responsible of impossibility to deliver the parcel to the correct destination. The refusal of the buyer to provide data necessary for his order (such as a complete and correct address) will result in impossibility of proceeding with the delivery of products he would like to buy. A MON SEUL DESIR undertakes to communicate to the buyer by e-mail information concerning the delivery of his purchase as soon as the parcel is shipped to the post office. In case of damage during transport, a claim must be made immediately to the carrier upon receipt of the shipment. A MON SEUL DESIR is not responsible for any incidents or delays in delivery of your order, once it has been supported by postal services. Delivery times are only indicative. We are not responsible for delivery times. Nevertheless if they exceed forty five days from the order shipment, the contract of sale may be canceled and the buyer refunded. The buyer has a period of 14 working days from the date of reception of his order to return products and request a refund without penalty, except for the return costs. - The parcel must be returned to the personal expenses of the buyer by the same type of shipment as during shipping. - Important : please not that you must return your purchases with shipment provided with tracking ! - Without possibility to track and follow the parcel, unfortunately, it can be lost during the delivery and we will have no way to locate it or file a claim with the postal services. - All returned products have to be in excellent condition ( no breakage, no stain, no signs of wear ) and still in their original packaging. A MON SEUL DESIR address where products must be returned: A MON SEUL DESIR 3 Rue des ARQUEBUSIERS 75003 PARIS FRANCE. - Important : always keep all the proof, receipt and tracking number that you have handed over your parcel to the postal services. - Return & Refund does not apply for customized items according to your specifications. All information and personal data collected on the site "amonseuldesir.net" are required for billing and delivery but remain strictly confidential. A MON SEUL DESIR undertakes not to communicate, free of charge or with consideration, the details of its buyers to a third party, except if it is forced by a judicial authority or by law. You are only liable for any impairment of items's value caused by other handling than what is necessary to determine the nature, quality and function of the goods. We can not be held responsible for the improper use you may make of these products. We remind you that you must not wash with them or put them in water. Store them in a dry and temperate place. Avoid contact with perfumes, cologne or after shave (alcohol). A MON SEUL DESIR is not liable for any delays or for non-performance due to force majeure. For as long as a force majeure situation persists, we would be relieved from performance of our obligations.